Welcome to the first Food Waste Friday post of 2017. It’s also my first blog post of 2017. And it’s also our first snow of 2017 in the UK. It’s a bit of a running joke, in the UK, that we Brits see a snowflake and panic ensues. Our supermarket shelves are cleared before we’ve tied the laces on our snow boots (when we’ve managed to track them down of course). Rain we are ready for, snow not so much. As I look out of the window I see a dusting of snow left from the earlier downfall, but still it brings to mind a criticism that has been made of my approach to how I manage my store cupboard. I’m not a food stock-piler. This scares some people. But I live less than an easily walkable mile from two different grocery stores, we aren’t going to go hungry. Maybe this is because I generally can rustle up a meal from a selection of ingredients and also have an open mind as to what a meal can consist of. Particularly when it comes to emergency meals. Although not an emergency, I can get out of my front door (in fact school’s are not even closed – which is miraculous in the UK when snow first falls) – I’m still making an emergency meal, out of principle 😉 and to demonstrate that with as little as an egg, some plain flour and milk – plus leftovers – lunch is on the table in 5 minutes. Now typically if I have eggs I make an omelette – but what about if eggs are in short supply? Then it’s time to make emergency pancakes. And pancakes aren’t just for those of us with a sweet tooth – they easily translate into a savoury main meal. With the added bonus of being super economical. Whisk it all up in a jug – this will make 2 full-size pancakes. 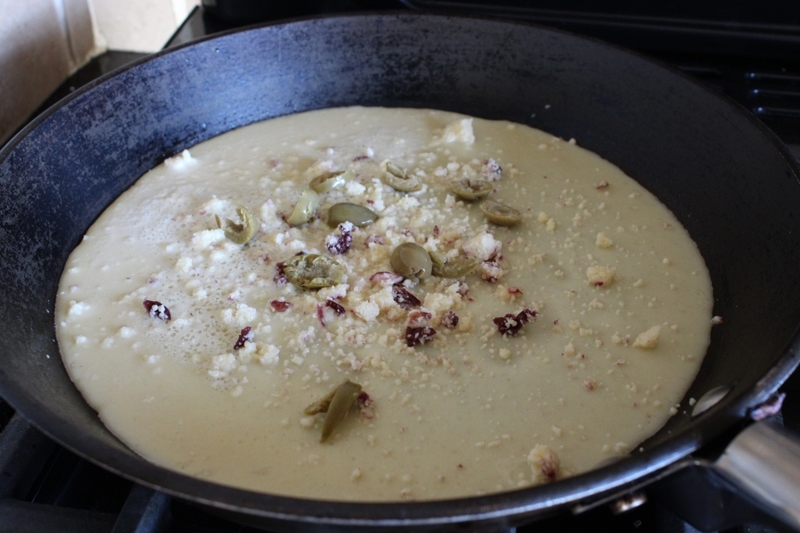 Pour half the mixture into a hot non-stick pan. I chose Wensleydale with cranberries and chopped green pitted olives. Not the prettiest looking pancake – but it tasted pretty good – and was a great lunch alternative to a wrap or sandwich. 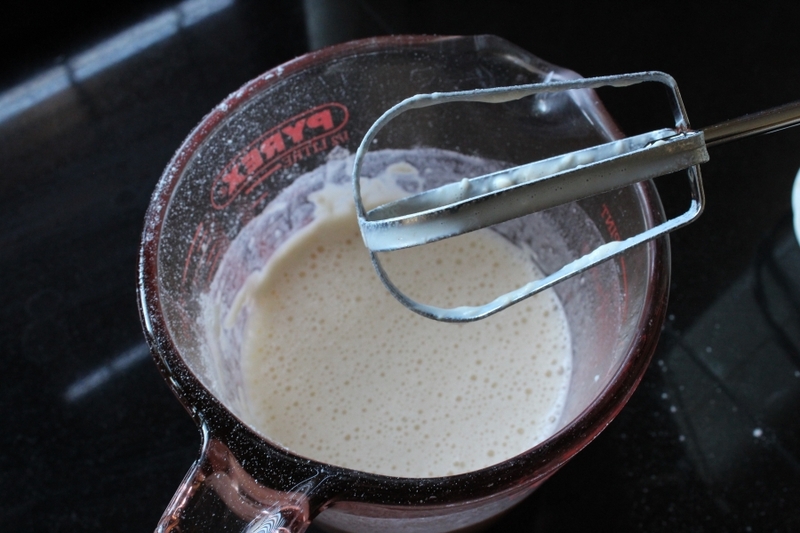 What are your favourite pancake fillings? 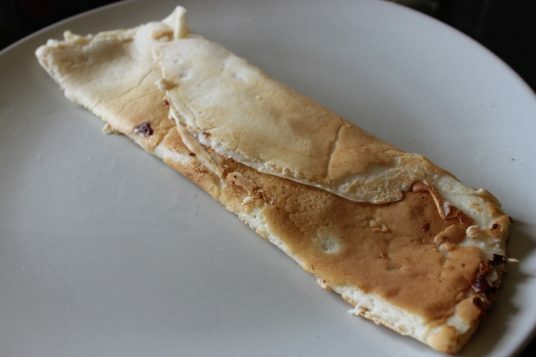 I love the sweeter pancakes…. traditional lemon and sugar for me!